There are some blogs and cookbooks that I feel like were created just for me, thumbing through the pages or scrolling past the recipes, I feel like every beautiful photo was taken for me, each recipe created with my eating choices in mind. While I am not so arrogant to believe this to be actually true, it is really amazing to know that there are people out there, just like me, eating intuitively – loving and celebrating all of the beautiful, seasonal, healthy whole foods available to us. 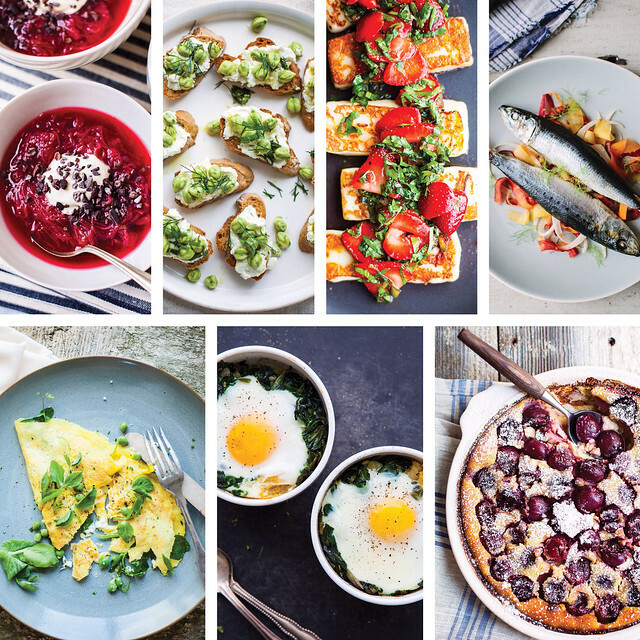 When I started reading The Year in Food, sometime last year, I instantly felt connected to Kimberley Hasselbrink, the creative mastermind behind all of the recipes and beautiful photos. Like me, Kimberley has a background in design, she, hailing from the world of furniture design, me, from a life of graphic design and it is clear in every recipe she develops. 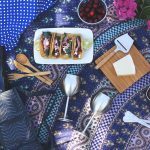 Her creativity shines brightly, as she creates a feast for the eyes by combining colors, textures, and flavors into her gorgeous, dynamic dishes. When I heard of her brand new book, VIBRANT FOOD, I knew right away before ever seeing it, that this was a book that I would absolutely love and would become a resource I turn to often. I was right. It is clear that Kimberley’s look at food is viewed through the eyes of an artist in search of beauty as well as flavor and that she’s wildly inspired by the vivid hues of produce. 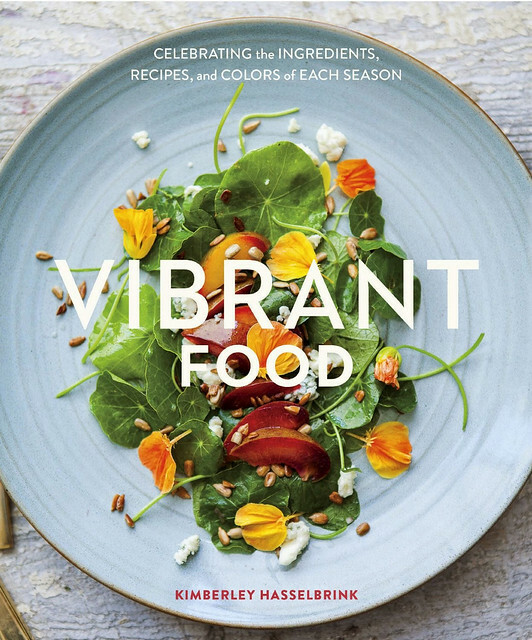 In her debut book, Vibrant Food Kimberley captures the radiant colors of each of the seasons with recipes that transform meals into captivating works of art. It is apparent the passion that Kimberley has for cooking, each recipe a celebration of color, flavor and mood. Besides being an inspiration in the kitchen, it is hard not to be inspired visually, as well, as you make your way through the incredible, drool-worthly photographs on each page. From Red Beet Risotto and Chocolate Truffles with Bee Pollen to Grilled Halloumi with Strawberries and Herbs to Rhubarb Compote with Cocoa Nibs to Rosé Sangria each and every recipe pays artful tribute to nature’s magnificent bounty. Arranged by season, the recipes in Vibrant Food are super easy to navigate and find and are definitely the type that you will find yourself turning to for your every day cooking. For those like me, needing to eat gluten-free, this book is almost entirely gluten-free with over 55 recipes being naturally gluten-free, or with simple instructions on how to make it so. There are just a few recipes that call for all purpose flour or bread crumbs, which could be easily swapped out for your favorite gluten-free version. The bonus is, there are even a few gluten-free baked goods throughout the book, including a beautiful Almond Honey Cake with Poached Quince that is calling my name for this fall. Featuring more than sixty-five simply elegant, yet fuss-free recipes richly-illustrated with 180 full-color photographs, Vibrant Food offers an artistic collection of whole food creations that will bring year-round splendor to any table. When my advanced copy of Vibrant Food arrived on my doorstep a few weeks ago, I tore into the package excitedly and spent a good few hours taking in every recipe, being moved and inspired by all of the amazing bounties each season has to offer. I decided in true seasonal-foodie form, to take this beautiful cookbook with me to the farmers market basing the recipe I would share, on what was most in-season right now. With the beautiful book clutched carefully under my arm, I already had some favorite recipes that I was dying to try and at the second farmer’s booth that I stopped at, he just so happened to have a small flat of mixed seasonal summer berries, 3 pints for $10. 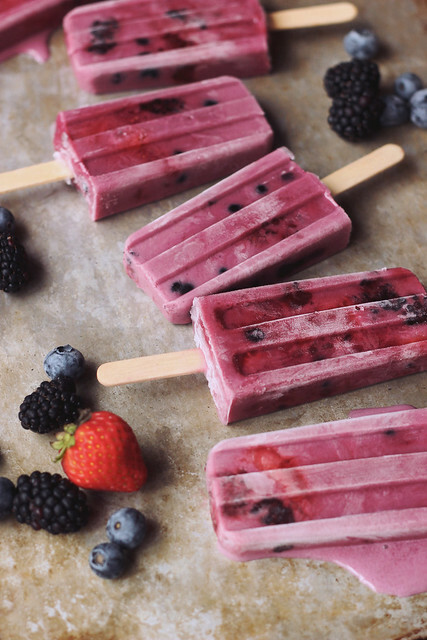 Believe it or not these strawberries, blueberries and blackberries, were exactly what I needed for one of my favorite recipes from the book, these Summer Berry-Coconut Milk Ice Pops. It was kismet. As it usually happens for me, the season and the local farms decided exactly what I would be making and I wouldn’t have it any other way. It always feels so right. What Kimberley Says: I love those instances when so few ingredients come together to make something so big in flavor and so deeply satisfying. 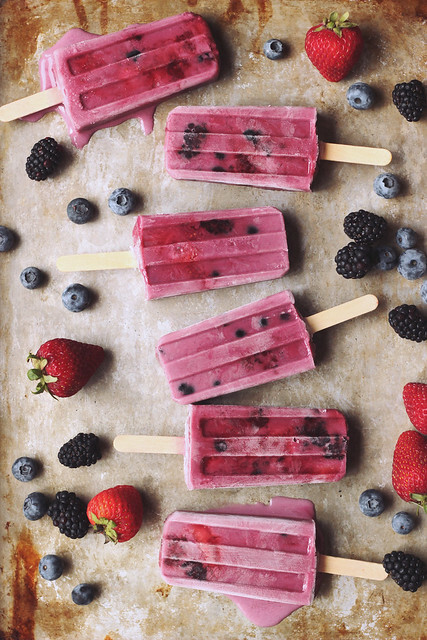 The jammy mash-up of berries with the coconut milk and cardamom makes these pops just rich enough and rather irresistible. They never last long in the freezer. 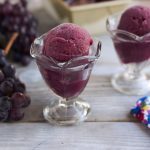 What Beth Says: Much like Kimberley, I am a big fan of simple recipes, with short ingredient lists – that really pack a punch in the flavor department. These ice pops are the epitome of that. Celebrating some of my most favorite things all together in one. 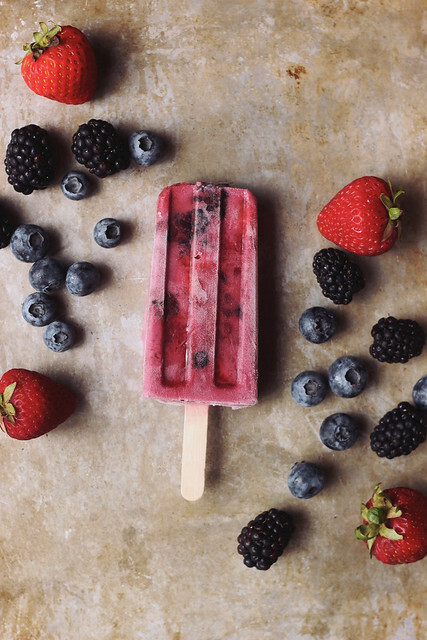 Bright, fresh, sweet and tart flavor from the perfectly in-season berries, with a kick of unique flavor from the cardamom, all brought together with the creamy coconut milk. Recipe and photos (all except the three ice pop images shot by me) reprinted with permission from Vibrant Food: Celebrating the Ingredients, Recipes, and Colors of Each SeasonBy Kimberley Hasselbrink, copyright © 2014. 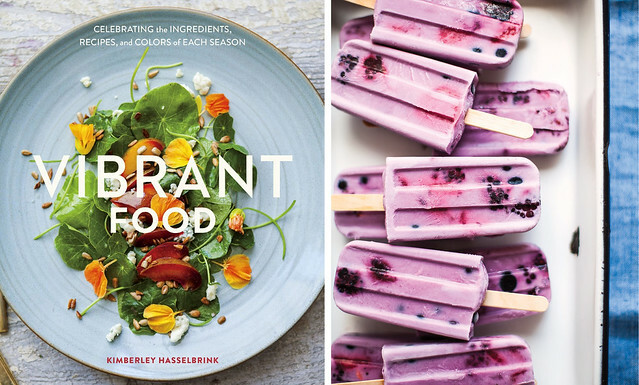 Published by Ten Speed Press, a division of Random House, Inc.
KIMBERLEY HASSELBRINK is a food photographer and creator of the blog The Year in Food. She grew up in California’s Santa Cruz mountains, went to art school to study furniture design, and left with a strong desire to focus on food and cooking by way of photography and writing. She has worked with Williams-Sonoma, Etsy, Bon Appetit, Kinfolk, and Edible San Francisco, among others. She currently lives in San Francisco, California, where she obsesses over produce and the ever-present fog and fantasizes about her next adventure in the mountains. Kimberley is available for interviews. This looks like a beautiful cookbook! 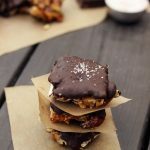 I would love to try some of these recipes this summer! The photos in that book look incredible from what I can see. What a lovely addition to a cookbook collection that would make! I love the title and the great photographs….would love to add this to my cookbook collection! Always looking for new inspiration! I also eat and cook seasonal so this would be the perfect book for me. I want a copy to encourage me to use all of those beautifully colored foods in my daily diet! The pictures are gorgeous and make me drool! 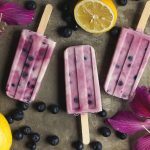 I laughed out loud when I read the line that the pops will last a month in the freezer – berries, coconut, cardamom, they will be lucky to survive a day! All of my favorites, need to buy freezer pop molds now. Thanks for such a wonderful post. i’d like to win because i haven’t seen or heard of this book before and it would be fun to try some recipes using all the fruits and veggies i get at the farmer’s markets! The food pictures from Vibrant Food look nutritious and delicious! Of course, you had me with the popsicles! Can’t wait to make them! Would love to receive the cookbook as we begin a much-needed journey into the gluten free world. My son has alopecia universalis and I have at the very least a gluten intolerance. Thank you for the opportunity! I love to win a copy so that I can take better advantage of seasonal produce. Loving the addition of cardamom in these! I love beautiful cookbooks, the recipes are just a bonus. This one looks amazing! Beautiful book. I would love to win a copy so I can try some of these fabulous recipes. The photo’s are amazing and I love lots of color in my foods! I loke the food photos which makes me want to try them all. I honestly believe that good food starts with your eyes. Colorful food always makes me hungry. I want to win the book for the photographs and recipes! The photos are beautiful and inspiring and the recipes sound delicious. There are just some cookbooks that an ebook won’t do. The Vibrant Food Cookbook looks like one of those books. This cook looks amazing, I believe that if we go back to the way nature intending eating to be and not what companies have made to be; America would be far more healthy. I would LOVE to get a copy of Vibrant Food. Kimberly’s photography is absolutely gorgeous. And I can only imagine that the food in this book tastes as good as it looks. I love cooking seasonally & teaching my children to appreciate what is in season now. This cookbook looks like a delicious way to show them! I would love to get my hands on this book as i’m looking for ways to add healthful and full meals in to my life. I love cookbooks and am always trying to come up with new ways to cook things! This looks like an amazing book with amazing photography, which really is important in a cookbook. I am always disappointed when ordering a cookbook only to find it is devoid of any photos of the recipes! I am currently playing around with an elimination diet and focusing on local fruits & veggies so this cookbook would fit in perfectly! Farmers’ Market/CSA season has just begun here in NH, a time when I am inspired to cook in season! Thank you for the giveaway opportunity, love your blog! Before I ever even read about the cookbook and its approach to healthy colorful food, I was sold by the beautiful cover! If the rest of it is as beautiful and elegant as that…and as delicious sounding as the pops…this will be a knockout cookbook! And I love the pops! Yum! !